The percentage of Greek debt held by public institutions as opposed to private investors has grown dramatically in recent years. In some ways this is similar to the US after 2008, with various Fed/Treasury programs, including Maiden Lane and the GSEs. Sadly, Greece will end up with the same or higher debt to GDP ratio than they had before the restructuring (IMF estimate is 167% for 2013 - for more information on the topic see this post from Kostas Kalevras.) In part this is due to Greece spending some €50 billion to bail out their own banks who are now bankrupt after having participated in the PSI (Greek banks held a big portion of Greek government debt and took a massive hit to their capital). But this process of shifting an ever larger proportion of sovereign debt onto the public balance sheets is not unique to Greece. Even without the PSI, Portugal is also in that camp. GS Research: ... As shown in chart below, Portugal is on a similar path. On the basis of the existing troika package (and again making assumptions about the SMP holdings), around 60% of Portugal’s sovereign debt will be held by the official sector by the end of next year. Should Portugal be unable to re-access the market in September 2013 (an eventuality that can certainly not be ruled out), that figure rises further – even in the absence of a Portuguese PSI. 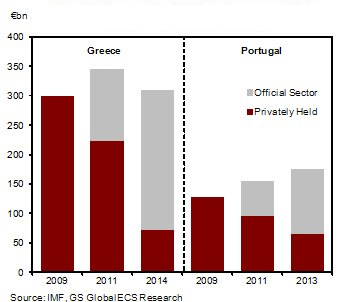 Just as Greece, Portugal has been bailing out its banks, but quietly. Portugal basically had the nation's large banks issue unsecured debt to themselves. The Portuguese government would slap a guarantee on that "internally issued" debt. The banks would then use their own bonds as collateral at the ECB to get LTRO financing. As an example on December 5th, BCP, a large Portugese bank issued €1.35B bond to itself with the government guarantee and placed it with the ECB as collateral (hat tip Alex Goncalves, @alexdgn). For more information on these activities see this story (in Portuguese). Excluding half of their State-owned enterprise (SOE) debt and bank bond guarantees from their debt to GDP ratio may in fact put them in a materially worse position than the troika's assumptions and requirements. Bloomberg: A similar [to Greece] shift of risk to taxpayers is happening with Portugal and Ireland. The ECB has bought 20 billion euros of each nation’s debt [this excludes lending to banks], according to Open Europe estimates, while the EU and the IMF provided 78 billion euros and 85 billion euros, respectively, in new loans to replace private financing for the two countries. In Ireland, most of the public money has been used to pay the debt of failed Irish banks. The ECB and the Irish central bank have taken over financing of the lenders, providing about 140 billion euros of funding and transferring risk to taxpayers. Since the November 2010 bailout of Ireland, European lenders have reduced their exposure to that country’s banking system by more than half to 61 billion euros. While current and past Irish governments have tried to stop paying banks’ debts with public funds, the EU has rejected the requests. This migration from private hands to public institutions does not include the enormous amounts lent by the ECB to the banking system, which for many European nations is a proxy of their governments (such as in the case of Portugal's government guaranteed bank bonds). The hope is that this shift will provide enough time and flexibility for these nations to eventually tap the private markets again. But given these GDP trends and the "cheating" that's going on with respect to these debt to GDP ratios, the public institutions (and therefore the Eurozone taxpayer) will have to wait a long time and take losses along the way before this becomes a reality.